Do you remember that last year on Good Friday, Google decided to celebrate the birthday of Hans Christian Anderson? If so you may recall that a lot of Christians on the right got upset about it. Rather than get angry... I decided instead to draw parallels between one of Anderson's works, and Good Friday. I feel you should look for opportunities in everything. Well... just over a year later and Google decided to pull a similar trick. 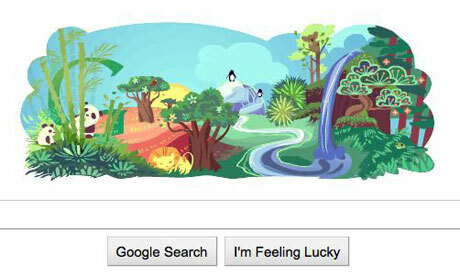 Yep... Google decided to celebrate Earth Day. Now Google is obviously a secular company and has no obligation to do anything for Good Friday. I know that voices on the right are again upset... and me? What am I going to do this time? I'm going to do exactly the same thing as I did last year - use Earth Day as a way to examine the importance of Good Friday. Every year when Easter Sunday comes around, it is traditional in some services to examine the entire story of salvation. How God created a perfect world, free from sin... and how he placed humanity at the heart of his creation to act as his appointed custodians/caretakers. The Bible says that God commanded Man to subdue the Earth... but what it actually means by this, is that we were intended to use it's resources wisely in the service of God and Man. “Cursed is the ground because of you; through painful toil you will eat food from it all the days of your life. It will produce thorns and thistles for you, and you will eat the plants of the field. By the sweat of your brow you will eat your food until you return to the ground, since from it you were taken; for dust you are and to dust you will return." To put it bluntly... we stuffed up! My belief is that after we strayed from God's initial command, we became selfish (and that our controlling nature and rejection of God is in fact what brings about the terms of the "curse"). This selfishness brought about an imbalance and rather than using the Earth's resources sensibly, we began to consume them in a manner that glorified ourselves but not God. Like parasitic leeches through the ages... we have taken and taken from the abundant things God has given us... but not given nearly half as much thought to what we should put back. "The earth is the LORD’s, and everything in it, the world, and all who live in it;"
In the modern age there are a growing number of people who have taken the cause of environmentalism to heart... and this is commendable. However if we put environmentalism and ecology at the centre of everything we do... socially or politically, we still fall short because the problems humanity causes the planet are only a symptom of the greater problem that needs to be addressed in the human condition. It's clear to me that if everything was made by and for Jesus; if all things hold together in him and if he considered all things on heaven and earth something worth giving his life up for... then ergo he can be trusted to look after our planet. If we put our lives in his care, we can be sure that he will shape us into people who make this world a better place spiritually, morally, ethically, ecologically... anyway you look at it. So as we remember Earth... let's not forget Heaven... because in his death and life Jesus reunited both.